Fluoromount-G® is a water-soluble compound recommended for slides mounted after a staining procedure having an aqueous final step. Since Fluoromount-G® is water-soluble, the coverslip may be removed by submerging the slide in a PBS solution until the coverslip is loosened. This mounting medium also provides a semi-permanent seal for storage of slide preparations. The refractive index of Fluoromount-G® is reported to be ~1.4 70. 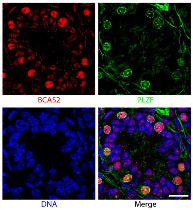 Paraffin embedded sections of mouse P8 testes were stained with anti-BCAS2 and anti-PLZF. The DNA was stained with Hoechst 33342 and mounted with Fluoromount-G® (SB Cat. No. 0100-01). Zika virus (ZIKV) inoculated frozen mouse placenta was stained with anti-flaviviruses and anti-cytokeratin. 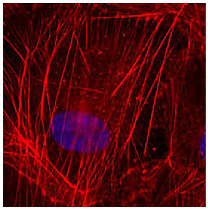 The DNA was stained with DAPI and mounted with Fluoromount-G® (SB Cat. No. 0100-01). 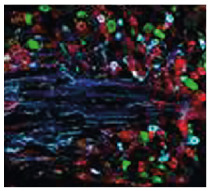 Frozen zebrafish retina section was stained with anti-Zpr3 followed by an AF543 secondary antibody and MBODEC and mounted with Fluoromount-G® (SB Cat. No. 0100-01). 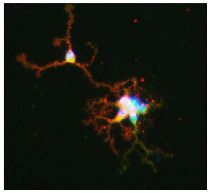 Whole mount Ophryotrocha diadema adult was stained with TRITC conjugated phalliodin and anti-acetylated tubulin followed by a CY2 conjugated secondary antibody and mounted with Fluoromount-G® (SB Cat. No. 0100-01). Whole mount Lineus albocinctus pilidium larva was stained with anti-FMRFamide and anti-acetylated- α-tubulin followed by AF568 and AF633 conjugated secondary antibodies and DAPI and mounted with Fluoromount-G® (SB Cat. No. 0100-01). 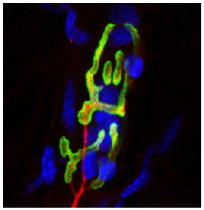 Optic nerve explant cultures were stained with anti-Stim2 and anti-GPAF followed by secondary antibodies. The DNA was stained with Hoechst and mounted with Fluoromount-G® (SB Cat. No. 0100-01). 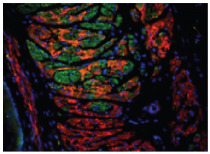 Frozen simian immunodeficiency virus infected rhesus macaque ileum section was stained with anti-IL-7 and anti-cytokeratin followed by AF488 and AF546 conjugated secondary antibodies and DAPI and mounted with Fluoromount-G® (SB Cat. No. 0100-01). Whole mount Symsagittifera roscoffensis embryo was stained with AF488 conjugated phalloidin and mounted with Fluoromount-G® (SB Cat. No. 0100-01). 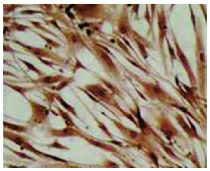 pEGP-BDNF transfected human umbilical cord blood-derived mesenchymal stem cells were stained with anti-BDNF followed by a secondary antibody and DAB and mounted with Fluoromount-G® (SB Cat. No. 0100-01). 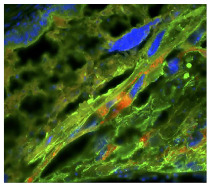 Twistp-GFP-actin-Vrp1f06715 transfected porcine aortic endothelial cells were stained with TRITC conjugated phalloidin and mounted with Fluoromount-G® (SB Cat. No. 0100-01). 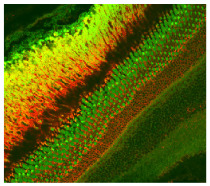 Cultured rat retinal ganglion cells were stained with anti-Thy-1 and anti-neurofilament-L followed by secondary antibodies and DAPI and mounted with Fluoromount-G® (SB Cat. No. 0100-01). Whole mount Hispolia malayensis zooid was stained with an AF488 conjugated phalloidin followed by DAPI and mounted with Fluoromount-G® (SB Cat. No. 0100-01). 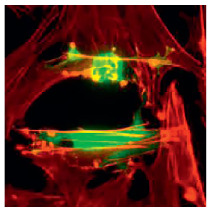 Arabidopsis culture following BrdU incubation was stained with anti-BrdU followed by an AF488 conjugated secondary antibody and DAPI and mounted with Fluoromount-G® (SB Cat. No. 0100-01). 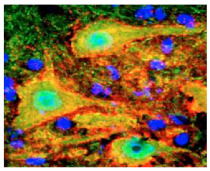 Human retinal pigmented epithelial cells were stained with 546 labeled phalloidin and Hoechst 33258 and mounted with Fluoromount-G® (SB Cat. No. 0100-01). 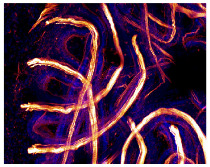 SLICK-H::Ranbp2flox/flox YFP-expressing mouse nerve cyrosections at day10 post-tamoxifen administration were stained with anti-HDAC4 followed by an AF594 conjugated secondary antibody, Hoechst 33342, and mounted with Fluoromount-G® (SB Cat. No. 0100-01). 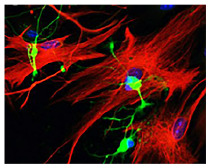 MDA-MB-231 cells were stained with conjugated phalloidin and mounted with Fluoromount-G® (SB Cat. No. 0100-01). 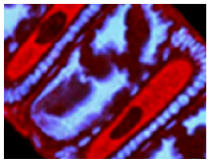 Frozen I4895T mouse soleus muscle section was stained with PROTEOSTAT® aggresome detection reagent and Hoechst 33342 and mounted with Fluoromount-G® (SB Cat. No. 0100-01). PROTEOSTAT® is a registered trademark of Enzo Life Sciences, Inc.
Human retinal pigmented epithelial cells were stained with anti-β-tubulin followed by an AF488 secondary antibody and Hoechst 33258 and mounted with Fluoromount-G® (SB Cat. No. 0100-01). 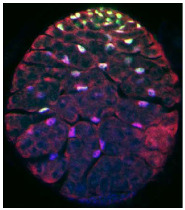 Whole mount Ophryotrocha diadema embryo was stained with TRITC conjugated phalliodin and anti-acetylated tubulin followed by a CY2 conjugated secondary antibody and DRAQ5™ and mounted with Fluoromount-G® (SB Cat. No. 0100-01). 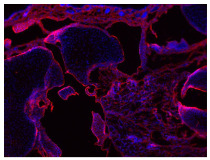 Frozen mouse circumvallate papillae section was stained with anti-IP3R3 followed by a Rhodamine Red™-X secondary antibody and mounted with Fluoromount-G® (SB Cat. No. 0100-01). Frozen Dcc+/+ mouse lumbar dorsal root ganglion section was stained with anti-CGRP, anti-isolectin B4, and anti-Substance P followed by AF488, AF555, and AF647 conjugated secondary reagents and mounted with Fluoromount-G® (SB Cat. No. 0100-01). 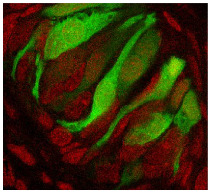 Frozen TRPM5-GFP mouse circumvallate papillae section was stained with propidium iodide and mounted with Fluoromount-G® (SB Cat. No. 0100-01). 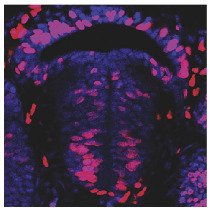 Whole mount Drosophila larva testis was stained with anti-DSXM, anti-TJ, and anti-EYA followed by AF488 and AF647 conjugated secondary antibodies and tyramide signal amplification CY3 system and mounted with Fluoromount-G® (SB Cat. No. 0100-01). 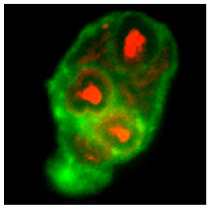 Whole S. littoralis ovariole was stained with anti-YP2 followed by an AF594 conjugated secondary antibody, Hoechst 33258 and mounted with Fluoromount-G® (SB Cat. No. 0100-01). 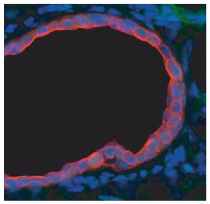 Frozen mouse embryo jugular lymph sac section was stained with anti-Prox1 and anti-LA102 followed by AF488 and AF594 conjuagted secondary antibodies and mounted with Fluoromount-G® (SB Cat. No. 0100-01). 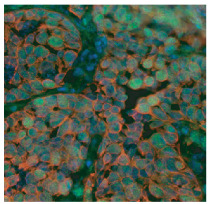 Frozen bitransgenic MTB/TRAS mouse mammary tissue section was stained with anti-cytokeratin 8 and anti-Smad4 followed by AF488 and AF567 conjugated secondary antibodies and Hoechst 33258 then mounted with Fluoromount-G® (SB Cat. No. 0100-01). 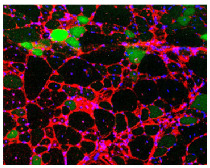 Paraffin embedded magnetically aggregated hepatocyte spheroid section was stained with anti-MRP2 followed by an AF488 conjugated secondary antibody, DAPI, and mounted with Fluoromount-G® (SB Cat. No. 0100-01). 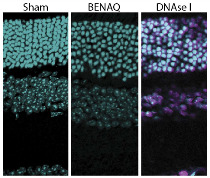 Apoptosis in frozen mouse retinal sections post injection of sham, BENAQ or after DNAse I treatment was detected with terminal deoxynucleotidyl transferase (TdT) mediated dUTP nick end labeling (TUNEL) and mounted with Fluoromount-G® (SB Cat. No. 0100-01). 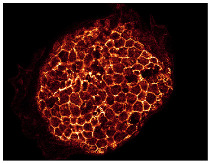 Whole mount Wirenia argentea larva was stained with anti-acetylated-α-tubulin followed a FITC conjugated secondary antibody and mounted with Fluoromount-G® (SB Cat. No. 0100-01). Frozen pCMV-eGFP-injected mdx4cv gastrocnemius section was stained with anti-desmin followed by a Texas Red® conjugated secondary antibody and DAPI and mounted with Fluoromount-G® (SB Cat. No. 0100-01). Texas Red® is a registered trademark of Thermo Fisher Scientific, Inc. Frozen bitransgenic MTB/TRAS mouse mammary tissue section 96 hr post administration of doxycycline was stained with anti-cytokeratin 8 and anti-Smad4 followed by AF488 and AF567 conjugated secondary antibodies and Hoechst 33258 and mounted with Fluoromount-G® (SB Cat. No. 0100-01). Whole mount Hispolia malayensis zooid was stained with an AF488 conjugated phalloidin and mounted with Fluoromount-G® (SB Cat. No. 0100-01). Whole mount Argyrotheca cordata larva was stained with AF488 conjugated phalloidin followed by DAPI and mounted with Fluoromount-G® (SB Cat. No. 0100-01). 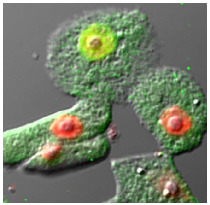 Human normal trabecular meshwork cell line was incubated with DiD labeled non-pigmented ciliary epithelium-derived exosomes for 32 hours followed by anti-α-tubulin and a secondary antibody. 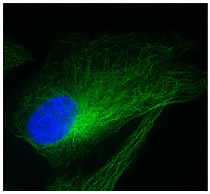 The DNA was stained with DAPI and mounted with Fluoromount-G® (SB Cat. No. 0100-01). EGFP-RhoB transfected HL-60 cells differentiated to granulocytes were incubated with Texas Red® conjugated zymosan A BioParticles® and mounted with Fluoromount-G® (SB Cat. No. 0100-01). BioParticles® and Texas Red® are registered trademarks of Thermo Fisher Scientific, Inc.
Apchu745 mutant zebrafish embryo brain section was stained with anti-BrdU followed by an AF647 conjugated secondary antibody, TO-PRO-3, and mounted with Fluoromount-G® (SB Cat. No. 0100-01). 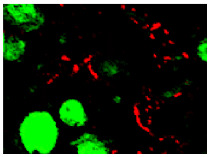 GFP-prestin/Xpress-tagged Fabp3 co-transfected opossum kidney cells were stained with anti-Xpress followed by an AF546 conjugated secondary antibody and mounted with Fluoromount-G® (SB Cat. No. 0100-01). 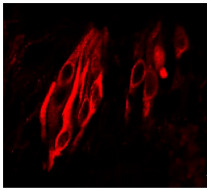 Paraffin embedded rat anteroventral periventricular nucleus section was stained with anti-GFAP and anti-NeuN followed by AF488 and AF633 secondary antibodies and mounted with Fluoromount-G® (SB Cat. No. 0100-01). 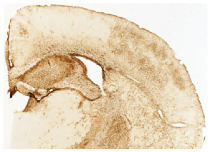 Paraffin embedded adult human wild type αSyn transgenic mice brain section post injection with recombinant human WT αSyn fibrils was stained with anti-GFAP and anti-pSer129-αSyn followed by AF488 and AF594 conjugated secondary antibodies, Sudan Black, and DAPI and mounted with Fluoromount-G® (SB Cat. No. 0100-01). 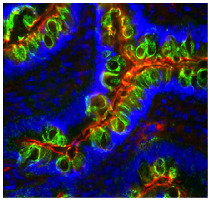 Frozen Pax7+/- mouse esophagus section was stained with anti-sarcomeric actin and anti-α-smooth muscle followed by AF488 and AF568 conjugated antibodies and DAPI and mounted with Fluoromount-G® (SB Cat. No. 0100-01). 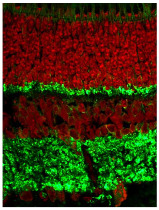 Frozen porcine retina section was stained with anti-SV2 followed by an AF488 conjugated secondary antibody, propidium iodide (PI), and mounted with Fluoromount-G® (SB Cat. No. 0100-01). 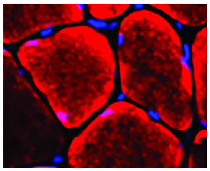 Mouse skeletal muscle fibers were stained with AF488 conjugated anti-BTX and anti-neuronal class III β-tubulin followed by an AF568 conjugated secondary antibody and DAPI and mounted with Fluoromount-G® (SB Cat. No. 0100-01). 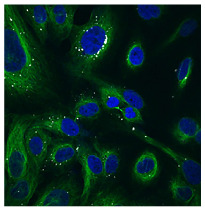 Frozen Tas1R3-GFP mouse larynx section was stained with anti-SubP followed by an AF568 secondary antibody and mounted with Fluoromount-G® (SB Cat. No. 0100-01). Amylo-Glo®, Fluoro-Jade®, and Fluoro-Ruby® are registered trademarks of Histo-Chem, Inc.
FD Rapid GolgiStain™ is a trademark of FD NeuroTechnologies, Inc. Brilliant Violet 421™ is a trademark of Sirigen Group Ltd.
FluoProbes® is a registered trademark of INTERCHIM S.A.
NorthernLights™ is a trademark of R&D Systems, Inc.
TACS® is a registered trademark of Trevigen, Inc.
CF® is a registered trademark of Biotium, Inc.
TSA™ is a trademark of PerkinElmer, Inc.